When submitting, first and foremost, all of our normal guidelines and submission types apply. If you are unfamiliar, head over to our Submissions page for that information. Second, like all of our stories, they must be Strange or Sinister in nature. Stories must be at least 1000 words and not surpass 5000 words. 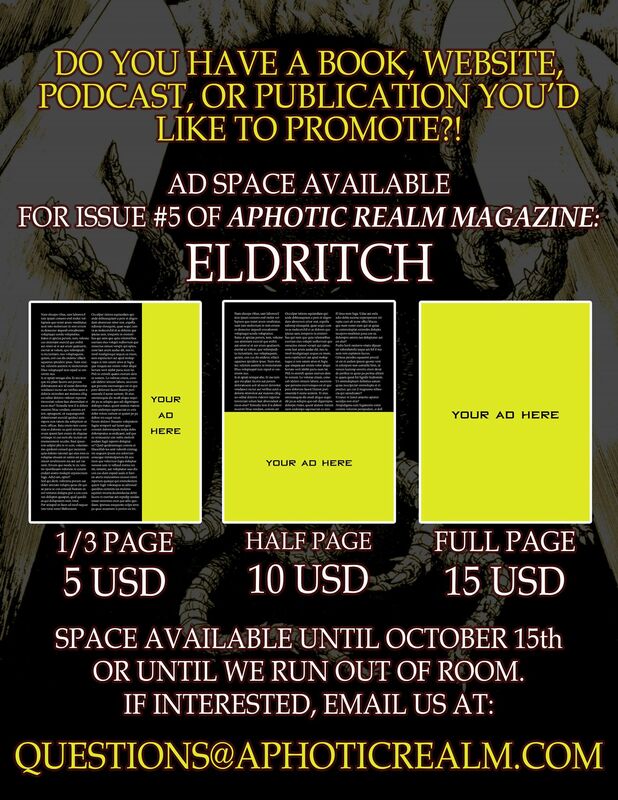 Please submit all stories to submissions@aphoticrealm.com. In the subject line please write, “Eldritch – Title of your story.” In the body of the email, please include a 50-100 word bio about yourself and your contact information. All stories must be submitted as a .DOC or .DOCX file. All other file types will be deleted without being read. In the coming weeks we will have more exciting news and announcements coming your way! Deadline to submit is October 1st, 2018!